Historypin is a photography based history app by the non-profit group We Are What We Do. They’ve teamed up with Google to provide a very interesting way to view and learn about pieces of history. 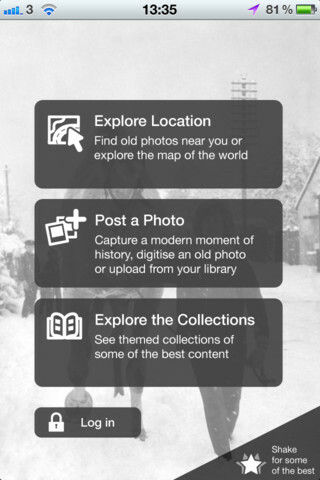 Historypin allows you to search locations to find old historic photos uploaded by other users ranging over the past two centuries. The photos also come with a little back story to explain what is going on in the photo and add more depth to the experience. Not only can photos be searched by place but they can also be searched by time. This feature is definitely useful for historic landmarks or larger urban areas that might have a dense collection of photos. Historypin’s success is due in part to its utilization of Googlemaps. By now it’s hard to find anyone in the world who isn’t familiar with how to navigate Googlemaps, although the addition of pinned photos does slow loading times a bit. With such a familiar template anyone can pick up Historypin and be easily browsing photos in no time. Uploading your own photos is also simple and easy to do. Another great feature of Historypin is the ability to compare old historic photos with current photos of the same location. The old photo can be placed on top of a Google Street View photo of the same location to see how drastically an area has changed over the years. This feature really makes Historypin shine, and it’s quite amazing to see how cities like New York and Paris and have changed over the ages. If everyone in the world downloaded and used Historypin then it would be a truly amazing app. This is not the case however, and the database of images is a bit limited. Historypin is most useful in major cities and popular tourist destinations. Nebraska for instance, home to more than a few national parks and monuments has no pictures to speak of. The same is true for a number of other U.S. states, not to mention many other countries across the world as well. Even a city as large as Jacksonville Florida only has one photo. Because of this looking to explore the range and depth of Historypin’s photo database could leave you a bit disappointed. In general, Historypin is a good app for history buffs or travelers looking to learn more about their destinations, but without a larger user base to provide a wider selection of photos it can’t quite reach its full potential. It is available for free on the iPhone, iPad, and iPod touch. AppSafari review of Historypin was written by Neema Akhtar on September 13th, 2011 and categorized under App Store, Education, Maps, Photos. Page viewed 5545 times, 1 so far today. Need help on using these apps? Please read the Help Page. History pin is very entertaining and unique. Ever wonder what a place looked like decades ago? 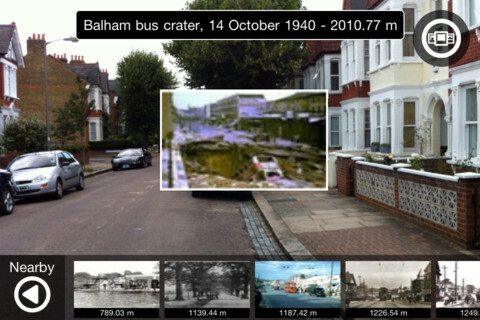 With History pin you can look back through time at photos of just about any location.